What an epic day! 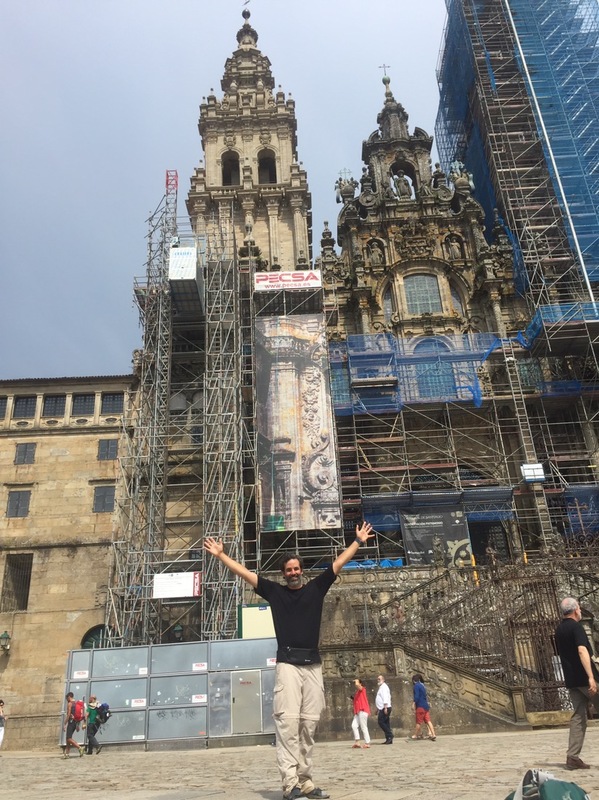 Today, I began my final day of walking to Santiago early. I was up before the sun and had a chance to see the stars for the first time in almost four weeks. Since the sunset isn’t until after 10pm here, I’ve been in bed before total darkness sets in. We set off on our way as dawn was starting to break. The sunrise was beautiful! We walked for three miles before finding an open café for coffee and breakfast. We decided that we wanted to go different speeds, so we made our way to Santiago on our own. I kept a pretty quick pace and decided to keep my stops to a minimum. I only stopped once to get a coffee after arriving in A Lavacolla. After that I charged on to Santiago. I arrived at the Albergue at a little past 12:30 and secured my bed for the night. I then made the final half mile to the Cathedral. It was an incredible feeling to be standing at my destination that I have anticipated so long to reach. I was unable to attend the mass as it had already ended, but I made my way to the pilgrims office to receive my Compostela and register for the mass for tomorrow afternoon. To be holding the Compostela in my hand, marking the end of my pilgrimage was met with both sadness and joy. But I feel deep inside, that my pilgrimage is not complete. Maybe after attending mass tomorrow and hearing my name read out to all in attendance, I will feel that it has reached its completion. But then again, maybe not. I know that I have discovered much inside myself on this journey, and much in the kindness of strangers who have become family. The distance that I had to travel to get to Santiago today was 18 miles. I explored the city a bit and racked up around another 7 more so my feet are tired. I am looking forward to being able to sleep in a bit and not have to get up and walk first thing in the morning. For my last few days in Spain, I can rest my feet. While wandering around the square in Santiago, I came across the two Camino family members who I started off with this morning. I treated each of them with a huge hug. We had traveled so long, and so far to reach this destination. We each had sore feet and knew some of the physical pain that each had gone through. I also came across other pilgrims that I had walked with and talked with throughout the past several weeks. It was nice to see some faces that I haven’t seen in many days. The standard “Buen Camino!” greeting no longer applies, because the Camino is Complete. We made it. The journey to Santiago has completed, but the journey of my life has not. What will I do after returning home? Go back to my job and begin my new role. That much I know. Take with me the experiences of the Camino and share them with others, like I have done with this blog.